Some time ago, while learning to use and writing a blog post about the Inline Form Errors module in Drupal 8 core, it occurred to me that there is a minor usability issue with the module, and that a custom module on top of it could solve that problem. Before you proceed further, I’d encourage you to learn some more about the Inline Form Errors module first. You can read my previous blog post about it here. When the user clicks on any error link in the error summary, they are taken to that particular error immediately and quite abruptly. This is not very easy on the eye. If the user has reached the bottom of the list of errors and wants to go to the top again, they’ll have to mouse-scroll to the top. This is not a very pleasant experience. What if the end user is not dealing with such a simple form and is dealing instead with 26 different field types on the node add/edit page? In such a case, the form will be very large. If the user is dealing with such forms via a narrow viewport, the problem will be significantly worse. To summarize, the magnitude of the problems becomes directly proportional to the number and type of form elements in the form. To overcome these minor usability issues in core’s Inline Form Errors, I created a custom module and contributed it to drupal.org. Let’s dive in to see this module in action. After you have enabled the module, the next step for you is to configure the transition settings provided by this module. To do so, navigate to the following path: Admin > Configuration > User Interface > IFE Transitions. Transition Duration: This is the time taken by the UI to transition from error summary to actual error element. Back To Top Text: This is the text to show on the back-to-top button. Back To Top Duration: This is time taken by the UI to transition from the bottom to the top. Smooth transition from error summary to error field. In today’s web war, user experience is the most important factor connecting the customer to the business. Thus, it becomes very important to enrich the user’s experience for every feature in your web application. 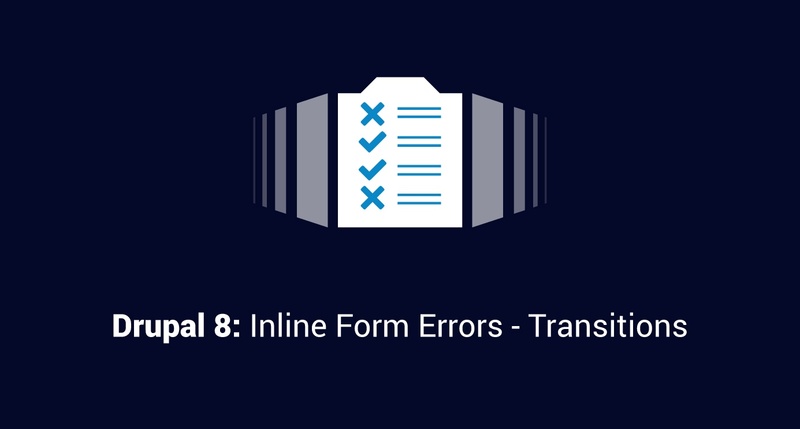 This blog post provides one such way of enhancing user experience with respect to Drupal 8 - Inline Form Errors. 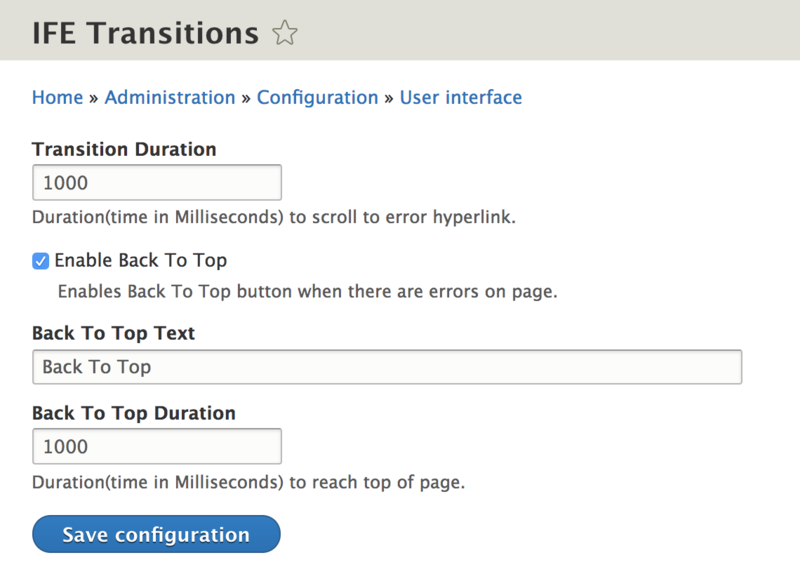 Note: The Inline Form Errors - Transitions module was released while writing this blog post. If you come across any issues or have ideas for new features that can be added to the module, please follow the module’s issue queue to add new requests and bugs. On his downtime, he blows off steam with hyped up ping pong matches. You know, the kinds you lose.